Here are some reviews from our clients over the years from Wales. Very happy with the service provided. Darren communicated with us well about the price and start times. The finished work was great and we were very happy with it. We would definitely use their services again. I have been contracting Darren and his team for over 6 years now for a wide range of building projects and their work has been excellent throughout. The attention to detail and level of craftsmanship demonstrated has resulted in every restoration project being completed to the highest standard. Darren and his team are highly experienced and meticulous, resulting in them having never made a single mistake on any of the projects they have worked on for us! For skilled, honest, considerate and reliable builders, look no further, they won't let you down. Perhaps the most telling fact is that we have returned time and again to DT Builders over 11 years to perform a number of tasks. We have always had clear estimates and, whilst often subject to the vagaries of West wales weather, timely response and high standards of work. Always prepared to come back to check on any difficulties (very few! ), the whole team have always been cheerful and hardworking. Fed appropriate quantities of tea/coffee and biscuits, they have stuck to the task, often in challenging weather, delivering to schedule. What a relief to find a builder who does exactly what he says he will do, when he will do it and for the amount agreed. So happy. Darren and team have worked on our house twice now, both times we have been really pleased with work. Wish we'd found him a long time ago! 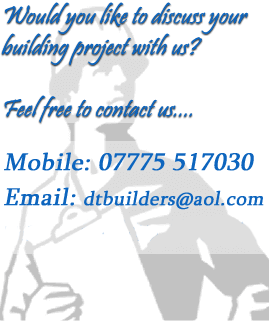 We have used DT builders for three years now on various external and internal projects. Darren and his team provide an efficient, cost effective, friendly and reliable service at all times. Darren and his team are very reliable. Good hard workers. The job they did on the outside of my bungalow was 1st class and the lounge has been transformed from a 1970's wood panned feater wall to the now immaculate plaster wall. I am waiting for another estimate for more outside work to be done. Darren and his team are always busy but we'll worth waiting for. Gave a clear, detailed and fair estimate.Turned up on time to carry out the work to a more than acceptable standard. Polite and professional workers. No payment till complete and satisfied.